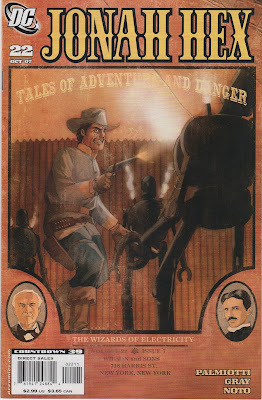 Matching Dragoons: Jonah Hex V2 #22 "The Current War"
Jonah Hex V2 #22 "The Current War"
A bolt of lightning break through the night sky and Jonah is caught in a downpour, followed by a man navigating what looks like a medicine show wagon. They arrive at a large house and Hex is ushered into the presence of a man seated in front of a roaring fire. The man, Mr. Booth, by name, has called for Hex and in an effort to explain WHY he needs a man of Jonah's skills, starts speaking of dime novels. He covers the brief history of this form of literature, starting with Beadle's Dime Novels and highlighting one published in 1862, The Steam Man of the Prairies and how it impacted his life. Booth then queries Hex if he has heard of Edison and Tesla. Jonah acknowledges having heard of Edison. Booth leads Hex to a large barn on the property and starts speaking, both at length and to the consternation of Jonah, about the upcoming twentieth century and wonders that it will surely hold. In the barn, a laboratory and workshop, Booth uncovers and large sheet covered Automata, a robot of sorts. He describes how Nikola Tesla is currently working on devices such as the one standing before them. Booth explains how, a week ago, a worker of his, Albert Fennimore, has stolen the newest model of Booth's robots as well as the blueprints and has undoubtedly whisked them away to Edison. Jonah doesn't seem very interested in tracking a a tin man, but Booth is persistent, explaining that two men, along with a vary large crate, were seen leaving two days on a train bound northward. Booth offers $10,000 and states that he is not asking that Edison or his men be harmed, but if such happens, then why should either of them care? Booth states that the train was headed to Denver and Edison is know to have a fortress there. Under cover of darkness, Jonah comes riding through a mountain pass and eventually arrives in front of a huge stockade fort. Two armed guards inform Jonah that he is to leave but Jonah tells them to announce his arrival and that he was sent by Aubrey Booth. The guards are not swayed and when they tell Jonah to leave, he knocks one down with his horse and leaps upon the other one, holding him a gunpoint when reinforcements arrive. Jonah demands that he be let in so he can determine the accuracy of Booth's claim that his invention was stolen. The guards take him inside. Inside, there is a giant Tesla coil (?!?) in the center of the courtyard, lights strung all about, and several large robots being worked on by assistants. Eventually, Hex is escorted into the lab and the presence of Thomas Edison himself. Edison asks of Jonah's business and Jonah lays his cards on the table. Edison, draping his arm around Jonah's shoulder, states that they shall have supper together and sort this entire matter out. Jonah replies that Edison shouldn't be touching him. 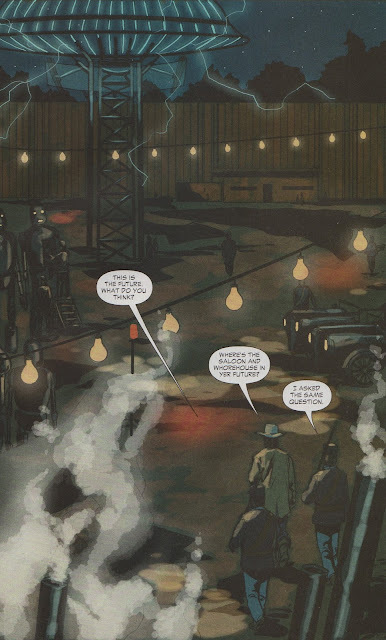 At dinner, Edison asks if Jonah has ever seen electric lights before and Hex confesses that he has, in Gotham City. Edison waxes about how, soon, the country will be covered with his electric bulbs, banishing the darkness. Hex asks about Booth's machine. Edison explains that the Steam-Powered Man was actually and invention of Edison's and Booth, a former employee, is the one that stole it. Edison produces papers indicating that Booth was an employee and worked on the Steam-Powered Man project. Jonah asks how hard it would be to falsify such papers. Edison states that he COULD have done so, but sending Jonah away would have been much easier. 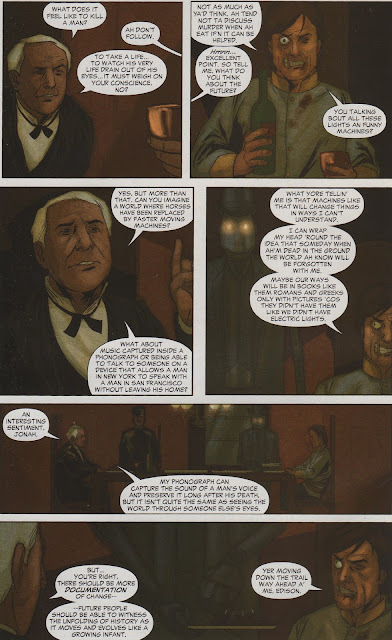 Edison then steers the conversation to the business in which Hex finds himself employed, bounty hunting, and talk of the future and all that it holds. During their conversation there is a huge noise outside and when Edison and Hex investigate they discover the walls have been breached and several masked men are riding inside with torches and causing mayhem. One of Edison's guards say they could be locals, afraid of the mystery surrounding the labs and the fortress. Hex sees that one of the men has dynamite and shoots the explosive, killing the man. Jonah grabs the man's horse, mounts up, and starts shooting several of the remaining invaders. Edison notices a symbol on the jacket of one of the dead invaders. Jonah explains that Booth had the same symbol on his jacket. Edison is convinced that Booth sent Hex to find Edison so that Booth's men could come and kill him. He also speaks of Tesla, another of his enemies that want to see him destroyed. Edison tells Jonah that maybe men will eventually stop killing each other with bullets but may utilize guns that shoot electricity and offers Jonah the job of personal body guard and perhaps even to eliminate Tesla. Jonah turns him down, but does demand money for helping save Edison's precious labs. Surveying the damage that has been done, Edison tells Jonah that the machine age IS coming and soon the skies and streets will be full of machines. Jonah replies that by then they both will be dead, and better off for it. Timeline - Not sure WHERE Jonah started or how long it took him to get to the Rocky Mountain near Denver. Let's just call it a week and be done with it. Edison's reference to Tesla and their broken contract of $50,000, puts this one after 1884. Booth's mention of alternating current, pushes this closer to 1890. Wow, what a stinker to return to blogging with. I'm not a fan of Noto's work and his coloring looks like cheap Heroclix figures dipped in walnut varnish. Everything is dark, murky, stiff, muddy. I would be inclined to call it 'meh' but that would entail more work than what Noto put into the colors. If this was someone's introduction to Jonah Hex, I can see them never picking up another book of Jonah's. Yeah, it IS that bad. Next Issue: Indians, The Army, and someone gets 'schooled'! !